Sony’s PlayStation 4 Pro 2TB 500 Million Limited Edition console debuted last night at several retailers, including GameStop, Best Buy and Amazon. As was expected, it was sold out within minutes. Buyers who missed out last night got more chances today from Target and Walmart, which opened their sales on the console this morning, but they also sold out in seconds. However, if you missed out both times, don’t worry; you can still buy the limited edition accessories. The limited edition of the DualShock 4 controller and the Gold Wireless Headset are still available. You can buy them from Amazon, Best Buy and Gamestop. These accessories perform the same functions as the standard controller and headset, but they look gorgeous in the translucent blue shell. Sony’s Limited Edition DualShock 4 controller costs $65, while the headset will set you back $100. The limited edition headset is a deep blue version of Sony’s Gold Wireless Headset. The headset offers 7.1 virtual surround sound and features noise-canceling microphones to ensure that your teammates hear you loud and clear. Those who don’t want the translucent blue controller can pre-order the new DualShock 4 designs, which the Japanese company will release early next month. The company is taking pre-orders for four versions: the Berry Blue DualShock 4, Sunset Orange DualShock 4, Copper DualShock 4 and Blue Camouflage DualShock 4. Like the limited edition model, these controllers also cost $65. 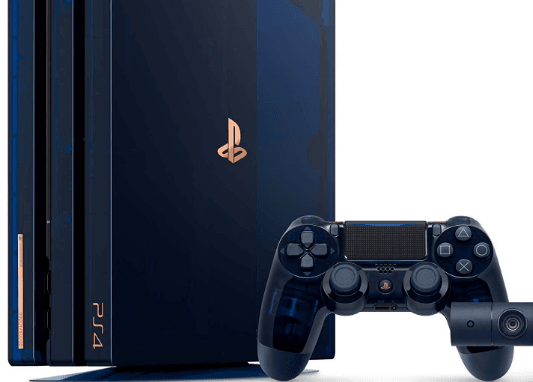 Those who have still not given up hope of buying the PlayStation 4 Pro 2TB 500 Million Limited Edition console can head to eBay, but be prepared to pay extremely high prices. Scalpers are selling the console on eBay for more than $1,000. The prices are expected to go up after all the consoles have shipped and there is confirmation on the copper plate serial numbers. A few of the consoles will get “extra special” serial numbers to honor important events in the history of PlayStation, Sony said. For instance, there are the numbers 01115 (Nov. 15, 2013, the U.S. launch date for the PS4), 09995 (September 9, 1995, the launch date of the original PlayStation in the U.S.), and 01013 (Oct. 13, 2016, the U.S. launch date for the PS VR). Sony came up with the PlayStation 4 Pro 2TB 500 Million Limited Edition console to celebrate the 500 million systems in use around the world. The original PlayStation debuted about 25 years ago. The new limited edition consoles were made special with the translucent blue casing, and the company manufactured only 50,000 of them. The limited edition console was priced at $499.99 and includes a DualShock 4 wireless controller, PlayStation Camera, vertical stand and mono headset. With all attention on the PlayStation 4 Pro 2TB 500 Million Limited Edition console, Sony also quietly launched the PS4 Cloud Remote. The PlayStation is not just a gaming console; rather, it is a great media streamer and Blu-ray player as well. Though users can already control these functions with the provided controller, the new PS4 Cloud Remote seems more convenient. Sony’s PS4 Cloud Remote was developed in partnership with Performance Designed Products (PDP), a company well-known for making gaming accessories like controllers, screen protectors, headphones and more. The remote uses Bluetooth to connect to the PS4 and uses the PDP Cloud Remote App to automatically detect other devices connected to the PS4. Thus, it will help users control their TV (power, input, and volume) as well, relieving the pain of searching for another remote. The remote includes important buttons for navigating system menus and apps. It is also much handier than the pad to control media playback. “The compact design of the Cloud Remote makes it simple to find the button you’re looking for—and you can reach all essential controls under one thumb! It has everything you need and nothing you don’t,” Sony says in a blog post. PDP is taking pre-orders for the PS4 Cloud Remote at $29.99. Ordering the remote will also get you a 30-day free trial of the PlayStation Vue Core plan, which costs $49.99. Vue Core provides access to live TV and sports broadcasts on several networks like ESPN, FX, AMC and more. The PS4 Cloud Remote will be available starting September 18. Amazon and GameStop will also be selling the accessory.